No longer “interim,” Jim Riggleman officially took his spot at the Nationals Manager yesterday afternoon at Nationals Park. Rigs went 33-42 for the Nationals in his interim role, far better than Manny Acta could muster, and better than the Nats average since they came to DC. While the Nats have a lot of improvements to make, lining up Riggleman for next season was likely one of the more unexpected choices. With Don “Sideburns” Mattingly out there, and Bobby “I’m one craaaaazy mofo” Valentine, I half-expected Stan Kasten and the Lerners to bring in Valentine to throw bats into the showers and call people lollygaggers. I’m thankful they decided to wait a few years before doing that. The Nationals aren’t in a position to hire an A-grade manager right now. No A-grade manager worth his salt would take this job right now. There’s too much in transition, too much reputation at stake for what would be, at best, two losing seasons followed by a .500 season. Why not let someone of decent talent and demeanor soak up a few of those losses, and manage the talent that’s in the AAA and AA system into the majors? Thus enters the Rigs. 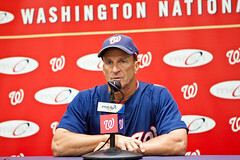 Will he be enough to get the Nats back toward .500? Yes, I think so. His choices were far less frustrating than Acta’s, and he actually seemed to have a personal stake in the day to day on-field action, instead of being an impassive sphinx.